University of Maryland University College Arts Program features works by Korean-born artist and First Lady of Maryland Yumi Hogan at its upcoming exhibition “Cultural Traditions Unbounded,” May 6 to June 30 in the Dorothy L. and Henry A. Rosenberg Jr. Painting Gallery at the Leroy Merritt Center for the Art of Joseph Sheppard, Adelphi, Maryland. The exhibit’s opening reception will be held Wednesday evening, May 8. RSVP here. Hogan, whose rendering style has been described by reviewers as “calm and airy,” draws on her memories and the traditions of her homeland to create abstract landscapes that express her responses to the natural world. 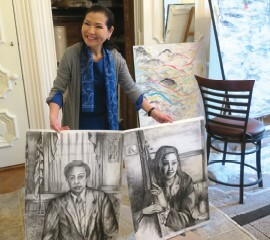 She blends traditional Korean and Western painting techniques—sumi ink and mixed media on traditional hanji paper—to create depictions of her current environment and life experiences. A leading advocate for the arts and arts education, Hogan, who teaches art classes to those battling cancer and to persons with disabilities, is a strong proponent of art therapy and its potential for contributing to our health and wellbeing. In 2018, she founded a full-spectrum art therapy program for patients at Children’s Hospital through her foundation, Yumi C.A.R.E.S. : Children’s Art for Recovery, Empowerment, and Strength. Her works have been featured in exhibitions and museums throughout Maryland, Virginia, the District of Columbia, and in South Korea. She received a BFA from Maryland Institute College of Art (MICA) and an MFA from American University. Hogan has been an adjunct professor in the Drawing Department at MICA since 2010. For more information about this exhibit and the UMUC Arts Program, visit Arts∣UMUC. RSVP TODAY for Yumi Hogan: Cultural Traditions Unbounded opening reception on Wednesday, May 8, 2019, from 5 p.m. – 7 p.m.
For more information, call 301-985-7937.